Perfume is like your personal signature and identity. It speaks volumes about you and your personality. It must be used every day and not just on special occasions. Luxury for the skin, perfume mingles with your natural scent, to project a truly unique fragrance. Though costly, it is important and an essential investment. Care must be taken for choosing the right kind of perfume. 1. If you have dry skin, remember that the fragrance of your perfume will be short lived. The same perfume will cling longer to a person with oily skin. Also, perfumes with musk or sandalwood fragrance last longer. 2. During summer, your skin tends to get oilier, thus enabling your scent to last longer. Therefore, light fragrances made from herbs, leaves, or pines are a good buy. 3. In winter, as your skin dries, go in for strong, full-bodied perfumes. 4. Never buy a perfume because it smelled good on someone. You cannot have the same body chemistry. 5. Your perfume must also help protect your personality. Light floral are for teenagers while heavy musky scents suit adults. 6. Never buy perfumes after eating spicy foods, fish, or garlic. This will mask the smell of the perfume. 7. Purchasing perfumes under stress or tension is also not a good idea. 8. Spray a little on the wrist and whiff it after one minute. 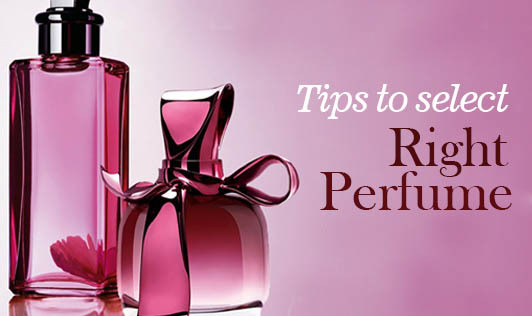 Do not spray more than three different perfumes at one time. 9. Remember that perfume envelops your body and perfume must be used daily but never in excess.